The learning area serving only the Faculty of Chemical Engineering and Biotechnology and Food Engineering is open 24/7 and includes 9 study rooms equipped with tables, chairs and an erasable table. 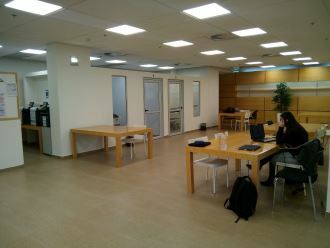 In the public space between the rooms are available for students: learning tables, computer for printing, printers and copier. In addition, a rest room is equipped with seating areas. Rooms must be per-ordered from BookMe using your username and password. The front door is controlled after working hours by a security system using magnetic cards, cards can be obtained from the faculty of Chemical Engineering secretariat room 332.